How to get enough sleep. The ocean is the origin of all life. Modern day living exposes us to the vagaries of the society. This includes noise pollution which is very rampant in our society today. While the effects of this noise pollution may be neglected, they often have adverse effects on the recipient. Often, these irregular sounds from vehicles, neighbors, factories, schools, and the workplace leaves us tired. In addition to this, multi-tasking, negative information from the TV, internet, Radio, email contribute to depression. This continuous cycle of life is not a very befitting one. Hence, finding veritable means to relax and stay positive has become necessary. What is the sleeping mermaid app? 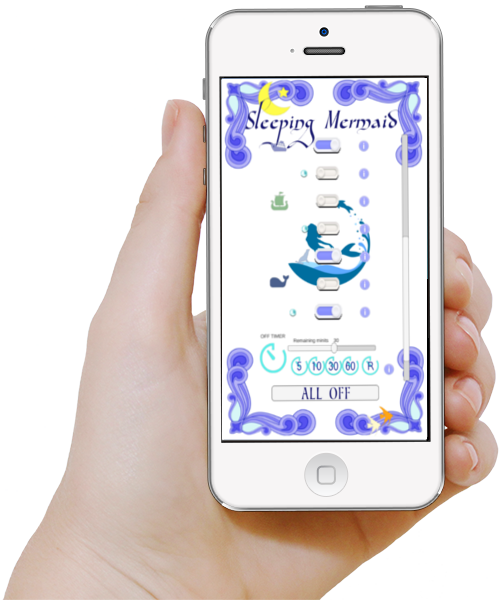 The sleeping Mermaid app is an app created to produce cool sounds for the relaxation. 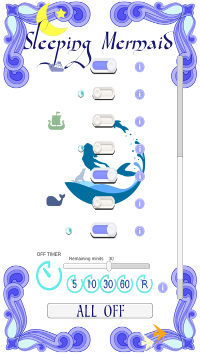 This app makes use of the relaxing effect of the sea on human and combines different sounds from the sea and ocean for the relaxation of the human. This app puts into effect the sound waves of the sea which brings about a feeling of nostalgia. 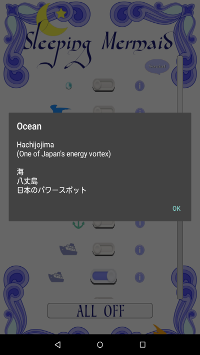 The app combines various sounds across the sea including sound from sea animals, birds, boats, ships and other various objects across the sea to help you have a quiet time and stay comfortable in noisy environments. •	It comes in a small data file for easy download. The sleeping Mermaid Application is easy to use. It comes in a free mode and small size so that it could be accessed and downloaded by every type of individual. Upon installation and opening of the app, a message pops us describing the app in few words. This message is written in both English and Japanese for easy comprehension. The app has 10 or more different sound which can be toggled on or off by pressing the button beside it. Beside each sound is a small button which brings out information about a particular sound when clicked. There is also a button that can be used to put off all sound by a simple click. 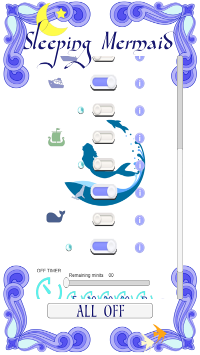 The Sleeping Mermaid Application allows for the combination of various sound to produce different rhythms. Multiple sounds or all of the sound in the app can be played simultaneously. The app has a timer which allows you to set the runtime for a particular sound. With the timer, you can set the runtime for each sound to 5,10, 30 or 60 minutes. There is also a release button which releases and put off the timer automatically. Purpose of using this app. The Sleeping Mermaid Application is not just an app, but it is an application with a difference. For women exposed to stress regularly and for those who go to work, this app can be of great help to them. This app connects you to nature, connecting you with the natural sounds of the ocean. 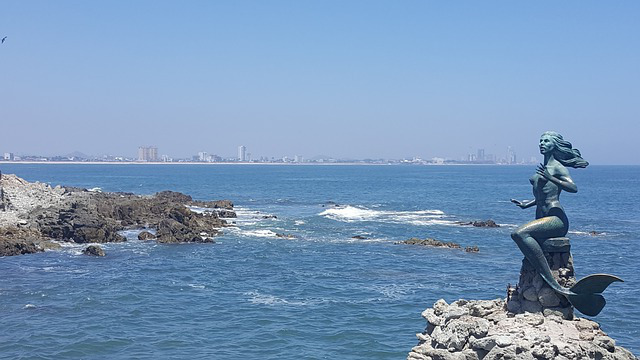 The wonderful sounds of the ocean, the sounds of the waves and the relaxing feelings when listening to the sound of the harbor does not only make you happy, but also gives you peace of mind. If you are a lover of nature, you will form a liking for this app easily. ・Sleeping Mermaid; The Solution to your Sleeplessness. ・Why does the sound of the sea calm you? ・10 reasons why you need a good sleep. ・Do you know the bad influence of multitasking? ・10 risks of noise threatening your health. ・Why is relaxation so important to your mind and body? ・10 Reasons Your Stress Management is Important. ・10 tips for your comfortable sleep. BLOGLOVIN' : Sleeping Mermaid : The best app! Meditation. Relax .Sleep. Pro Media Mag : Beauty Routine with Sleeping Mermaid. SBF Blog : Improve your beauty with Sleeping Mermaid App. MAZEDAR : SLEEPING MERMAID HEPLS YOU WITH YOUR BEAUTY. Off timer function. Even if you fall asleep while listening to the sound, the application will stop if it is the set time. Simultaneously playing multiple sounds, you can make only your soundtrack. For you who loves the nature.